Proton has been well known to offer a set of practical cars in its lineup, and the Saga is the smallest entry-level sedan in it. The sedan, based on the platform of Proton Iriz, is one safe car when it comes to design – the understated looks might not appeal to those who expect a certain amount of flashiness in their car. Even the interior cabin is simply laid out with a decent set of features. However, the Proton Saga excels in the core attributes like space and comfort, which an entry-level sedan buyer expects the most in his car. The Proton Saga is offered with only one powertrain option of a 1.3-litre petrol engine coupled to the choices of 5-speed manual and CVT gearboxes. The engine produces a maximum power output of 94 PS and a peak torque output of 120 Nm. Have a question on Saga? Saga is available in 5 different colors - Midnight Black, Metal Grey, Fire Red, Sterling Silver and Cotton White. Watch latest video reviews of Proton Saga to know about its interiors, exteriors, performance, mileage and more. The Proton Saga is the national car of Malaysia. Over its three decades of existence, it has gone through two generations and countless updates. But it has always relied on delivering exceptional levels of value for making sales. The value proposition, however, is extremely tricky to crack. The expectations of people keep increasing every year while they cannot be expected to pay more for what they get. Thriving or even surviving on such a USP is a nerve-racking prospect for even the biggest car makers in the world. And yet here we are reading the review of a car that is still known for being the cheapest car made by Proton in the country. It is on sale in the country for as cheap as RM 35590. No wonder it is often the first car ever owned or driven by many of us in Malaysia. So, how has the car that started it all, fared in its most recent iteration? The interior quality is cheap as can be expected at this price range. But it never gets unpleasant. And even so the basics are all covered. There is a 2 DIN head unit that boasts all the connectivity options from Bluetooth to USB on the Premium. The base models come with 2 speakers while the Premium and Executive come with 4. The Premium also comes with a reversing camera integrated into the rear view mirror. There are also two USB plug points. Steering mounted controls for the audio are available for the Premium. The steering, however, can only be adjusted for tilt but should be sufficient for people of normal height. The seats could also use some adjustability options on top of the slide and recline adjustability. Rear passenger comfort is decent. The legroom is increased from the outgoing model. This is because of the design of the rear sections of the front seats which are recessed. There is enough storage space in the cabin and the boot is now 420 liters which can be increased by folding down the rear seats. Life in the cabin is nice as it manages to shut out most of the noise and vibration from the engine, allowing the passengers to cruise nicely at high speed. As a compact sedan, its dimensions are appropriate reading 4331 (L) X 1689 (W) X 1491 (H) mm. The wheelbase is 2465 mm while the ground clearance is a decent 150 mm. The wheelbase is the only thing that is not larger than its predecessor. Simply because it’s cheap doesn’t mean that customers will settle for a box on wheels. Even at this price range, customers demand good looking cars from car makers. The Proton Saga is decidedly not boxy. The body shape is modern and looks like an evolution of the older model. The front end is especially recognizable even with its reshaped headlights. Touches of old and new design elements from other proton cars can also be seen in the grille and bumper. The hood has an unmistakable European contour to it. The rear is even more handsome with its segmented taillights joined by the black or chrome horizontal piece that runs across the width. The side also gets a more curved C-pillar that makes for a less boxy and well-proportioned shape. The standard variants get 13” wheels which go up in size by an inch for each subsequently higher variant. Tires are 175/70 on the standard, 185/60 on the Executive and 185/55 on the Premium. There are 4 variants available - Standard M/T, Standard CVT, Executive CVT, and Premium CVT. Powering all of them is a 1.3-litre 4-cylinder, fuel injected VVT churning out 94 hp at 5,750 rpm and peak torque of 120 Nm at 4,000 rpm. Power is sent to the front wheels through a 5-speed manual or a CVT. This CVT along with the ECU have been greatly improved and make for easy overtakes and acceleration. But the accelerator pedal needs to be used progressively and the driver should manage their expectations. The manual should serve those looking for a more spirited response. The suspension is set up on the firmer side which along with the hydraulic steering makes it easy to steer around corners. The handling has a planted feel that is quite surprising for a car like this thanks to the stiffened chassis. More importantly, the mileage figure is especially promising. Proton claims that the car can manage 17.9 kmpl on the CVT and 18.5 kmpl on the manual, while still doing 90kmph. While being impressive on their own, these numbers themselves are big improvements on their predecessor. They are, however, a fair bit lower than their biggest competitor the Perodua Bezza which claims mileage figures in 20-22 km/L range. There are ventilated discs on the front and drum brakes on the rear. ABS with EBD and brake assist is available on the Executive and Premium variants. Electronic stability control, traction control and hill hold assist, however, are only available on the topmost Premium variant. Thankfully all variants come equipped with dual front airbags, ISOFIX, and seatbelts with seat belt alarm for the drier and immobilizer with the alarm system as standard. There are parking sensors on both the front and the rear. 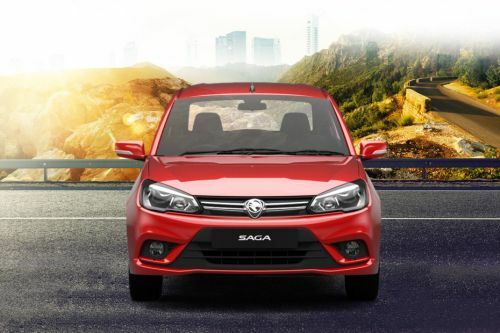 The safety of the car itself has undergone massive improvements and the Saga now enjoys a 4 star ASEAN NCAP safety rating. This used to be a three-star rating for the previous Saga. What are the Safety Features Available in Proton Saga?